Customer Testimonials. These ladies are just fabulous, and they are a part of the family! We love them and can’t imagine ever doing without them. We are so grateful for the wonderful job they do. MICHAEL I. Of course I will pay the additional price increase -and gladly. They Know my house and its cleaning peculiarities , do a highly satisfactory job, and are highly conscientious not only about their work but about the value of the few accessories that are important to us. 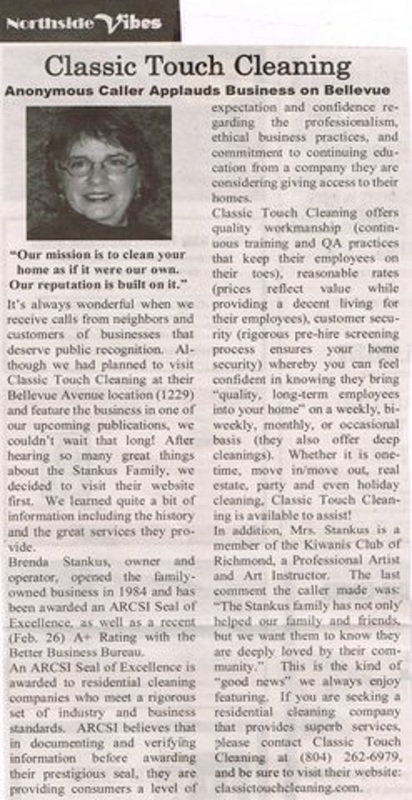 SANDRA W. Wednesday is my favorite day of the week- I know my house will be so clean that it sparkles! And as an added bonus the team that works on my house are always cheerful and friendly!! ELAINE M.
You do a wonderful job. Your staff is professional, pleasant and efficient. And we trust them, very important. MAUREEN C.